Looking for some new place for dinner? I'm here to introduce you all a new dining place in town. 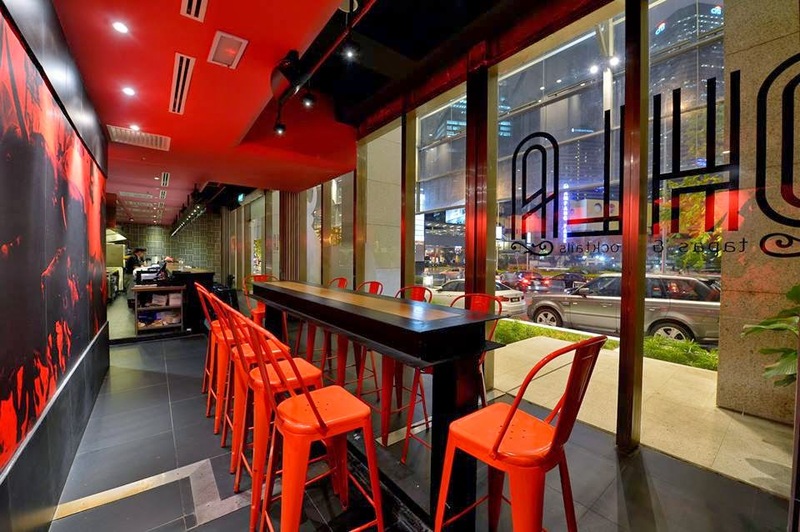 OHLA Tapas & Cocktails, it's located in The Intermark KL ( beside DOME cafe) Remember to pay a visit if you fancy tapas & cocktails. It’s very nice to go out with your friends and have some tapas during weekend. It's a nice place to chill out with friends too. 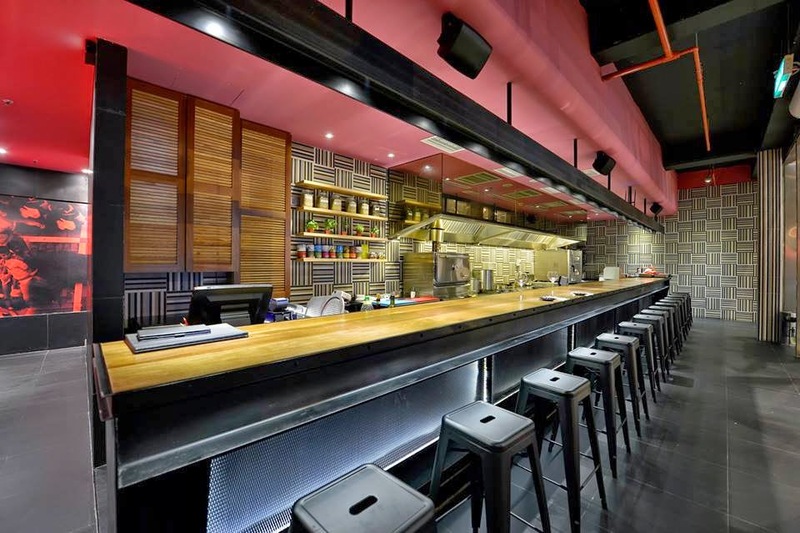 OHLA is setup like a traditional tapas bar with a long dining bar with high bar stools – no low dining tables here. 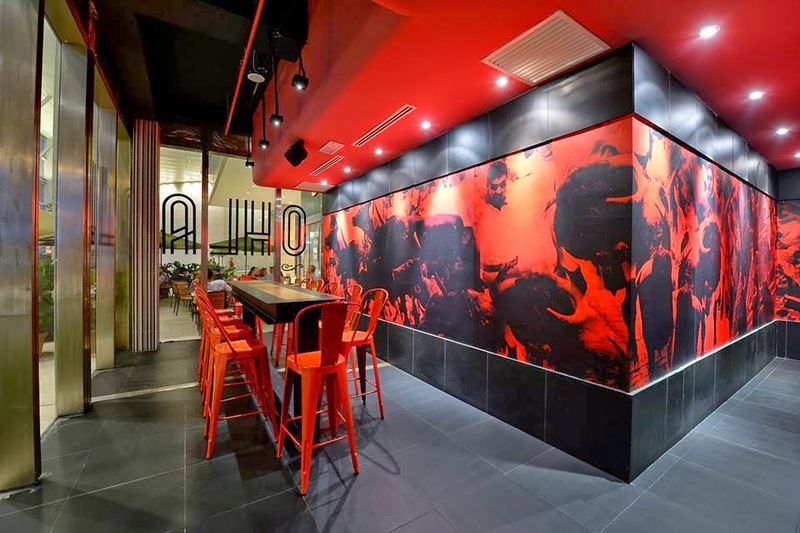 However, unlike the more rustic and traditional tapas bars in Spain, OHLA has a modern and chic design with colourful wallpaper and floor to ceiling glass panes which you can peer through to view the Twin Towers and KL’s busy bustling traffic go by. Here's a photo of the interior. Very modern & unique. OHLA is helmed by Toni Ruiz, head cook at Ohla, who has cooked in some of the finest restaurants in Spain, one of them being Mugaritz – a renowned restaurant in San Sebastian, and at El Celler de Can Roca, recently voted the best restaurant in the world. 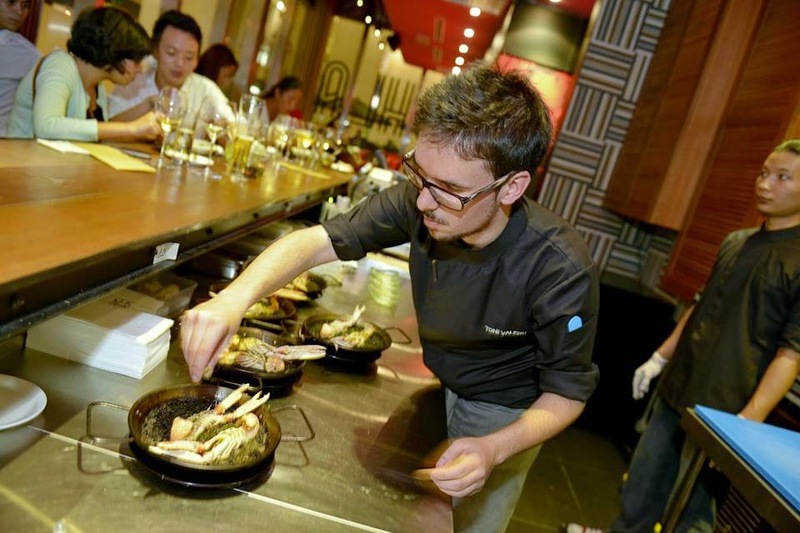 Toni is a passionate young chef who cooks pure Catalan menu – no fusion Malaysian/ European stuff here. The menu at OHLA is what you would get in a top tapas restaurant in Barcelona. Toni displays his skills and leads his team from an open kitchen, equipped with a specially-imported Josper charcoal-fired oven. I love TAPAS, because it's all in small portions. I love tapas because it's a great way to have as many new taste experiences as possible in one evening. We had salad as starter. 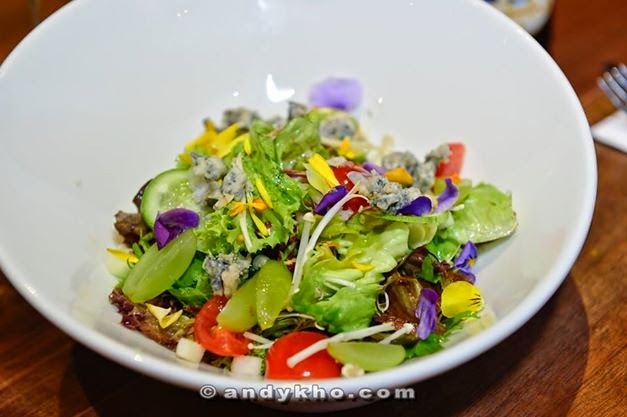 Mixed salad decorated with flowers, onion, apple, tomato and grapes dressing with honey and nuts vinaigrette – a light, but definitely tasty salad with dabs of blue cheese from the Roncal valley, this one was quite a pretty sight. 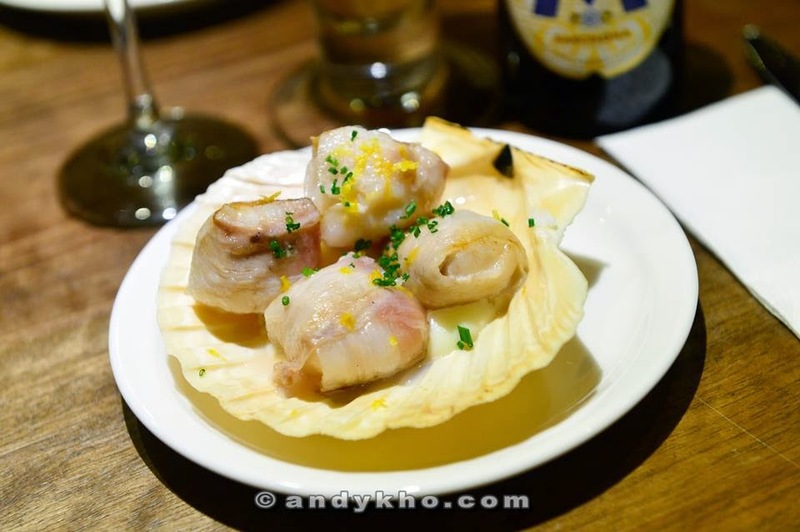 Scallops wrapped in savoury Iberico pork belly then grilled in the aforementioned Josper charcoal-fired oven. A delicious and tantalising combination of seafood and meat served on a bed of lemon mashed potato. A well balanced dish which imparted a host of different flavours and textures and was beautifully presented on a fan shaped shell. I love FOIE GRAS! 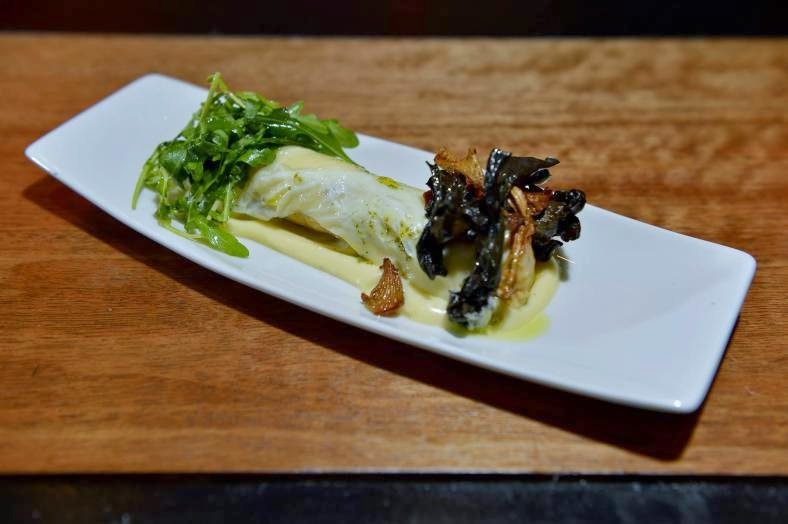 This one is served with a creamy potato puree, black truffle shavings, and a beautiful poached egg yolk. This was simply a delectable mishmash of flavours and textures. 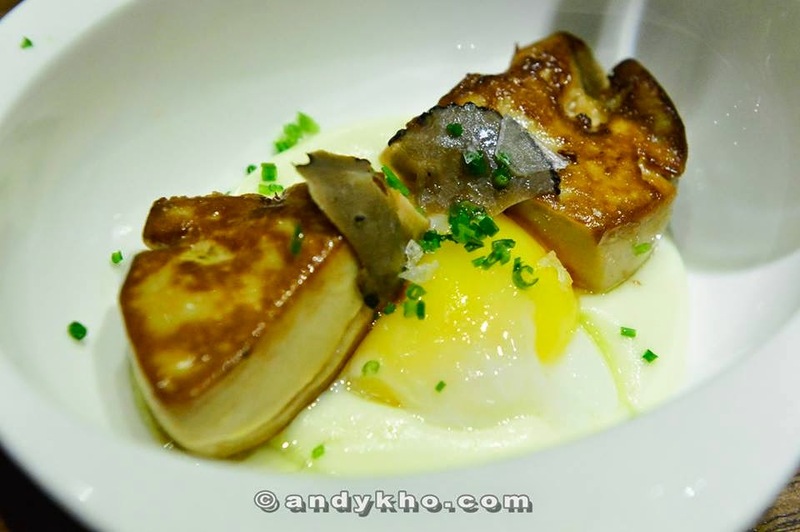 The earthiness of the truffle, richness of the foie gras, and the creaminess of the egg and potato puree. A must-try dish at OHLA! The cannelloni is like a Spanish “popiah” stuffed with roasted chicken and with earthy mushrooms topped with a rocket salad drizzled with parsley oil. The skin of the cannelloni is tapa, which is milk skin used in place of pasta. That is how you should cook a steak – gloriously pink medium rare! This is my favorite dishes of the night! I'm a big fans of Waygu steak! 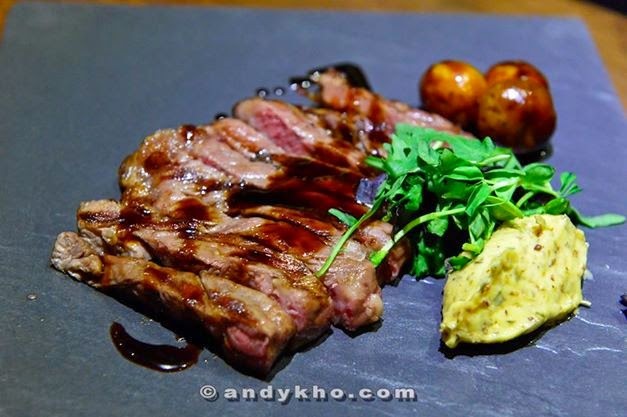 Served with mustard herbs butter and baby roasted potatoes and meat sauce, this dish was really to die for! Tender and flavourful strips of wagyu which barely needed the sauce to complement it. The mustard herbs butter added a nice richness and twist of flavours while the baby roasted potatoes were a delight to eat. Langoustines on squid ink rice with a dollop of aioli on the side to provide a little extra richness. I personally love langoustines which are shellfish known by a few different names – Norway lobster, Dublin Bay prawn or scampi (as you will hear quite often in Masterchef Australia). 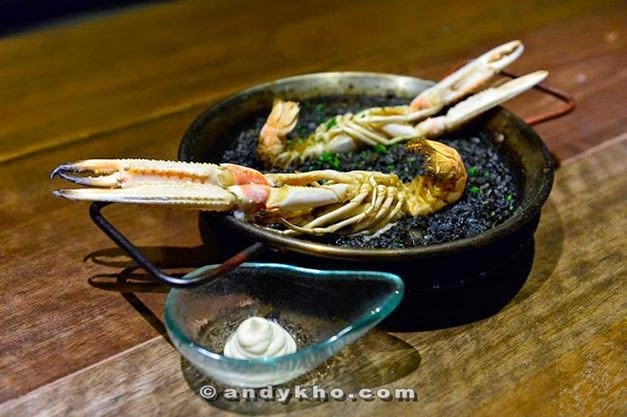 This dish is rather similar to traditional Spanish paella but it the rice was infused with squid ink and a langoustine broth which made it superbly flavourful. 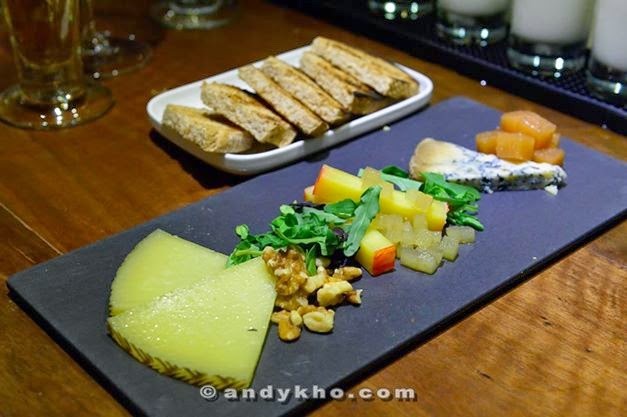 Spanish cheeses with apple, walnuts and quince paste – a platter of three cheeses with the mild Rocinate Ovesa Manchego Curado (cured goat’s cheese), to Queso Manchego D.O. Ovesa Semicurado (semi cured), to the strong Valdeon Blue Cheese Leon. 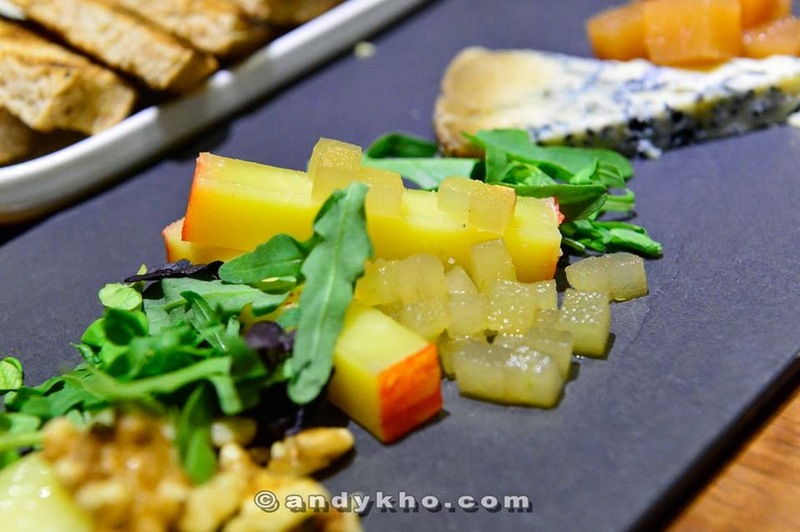 Served with crusty warm bread, this is a meal in itself for ardent fans of cheese! For all the CHEESE lover! You will love this! 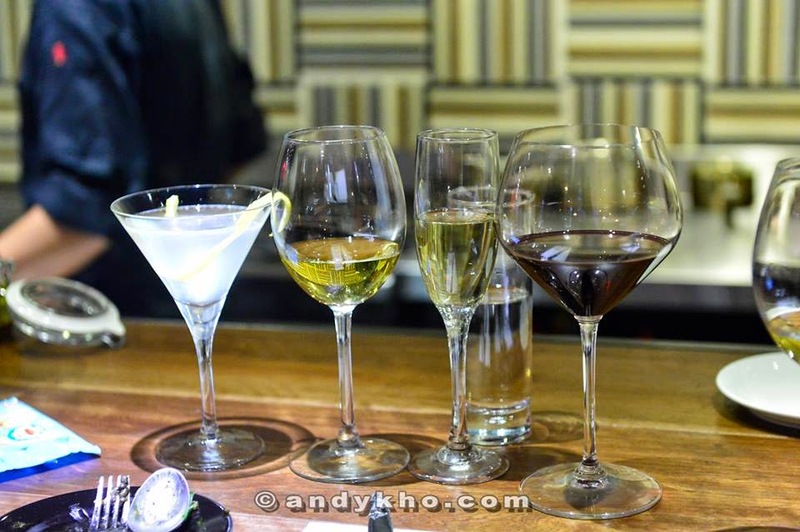 There was a constant flow of drinks being served throughout the night, from Vilarnau, Alvear, Cava, Moscatel, whiskey, sparklings to signature cocktails. Although we are feeling full…BUT, There's always room for dessert. Is there anything better than having a dessert after meal? Dessert never fails to put a smile on our face. The presentation for this dish left everyone with ooohs and ahhhs! 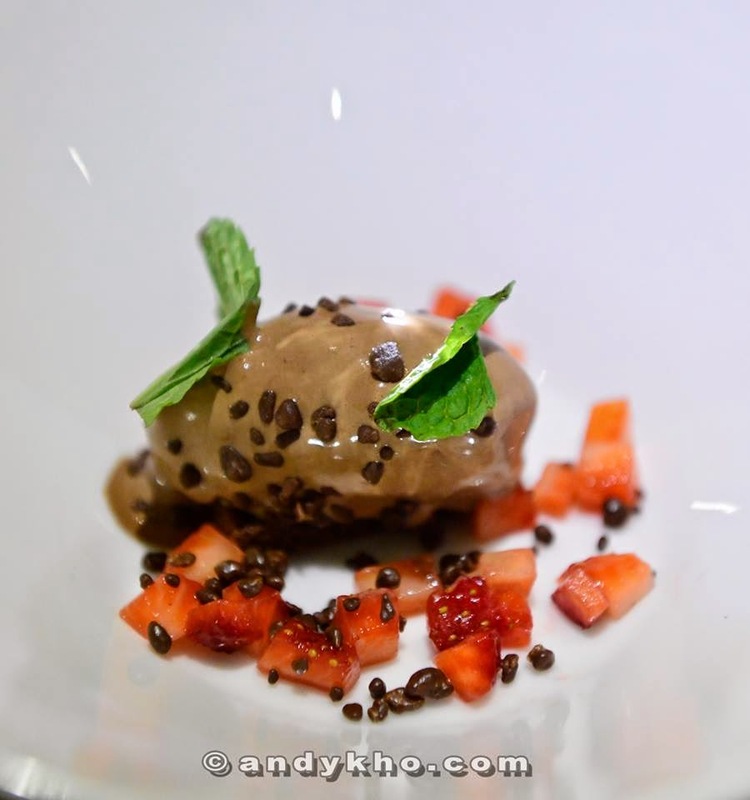 The vanilla and white chocolate soup was poured over the chocolate ice cream with chopped strawberries and small bits of chocolate which were eventually drowned in the soup. This provided both a contrast of flavours and textures in the mouth! Love it ! Yours truly & Chenellewen, we are pretty satisfy with all the food. I had a great night of being fascinated with amazing spanish tapas. Good web site you've got here.. It's difficult to find quality writing like yours these days.